Analyzing and interpreting your results. In my last post, I talked about the benefits of metabolic testing for endurance athletes – namely to assess your ability to resist the greatest limiter in events over 90 min – glycogen depletion. Make no mistake about it, if your interest lies on the Ironman side of the sport, this is the number that you should be interested in. VO2max and threshold numbers mean precious little when you run out of fuel! I also offered some guidance on the nitty gritty details of how to go about testing your metabolic fitness - both where you should go to get a reliable test and the best protocol for the job. I’m hoping that, due to my procrastination in writing blog posts :-), you’ve had sufficient time to have the test done and you have a nice little data sheet in your hands & you’re wondering what to do with it. In this post, I’ll go through that – the analysis and interpretation of your metabolic test results, i.e. what are 'good' and 'bad' numbers for fat-burning in the world of serious, competitive endurance athletes? First things first, what specific numbers from your test data are we interested in? It is from the RQ (or RER) number, that we are able to ascertain the relative % fat and carbohydrate being ‘burned’ at any one time. 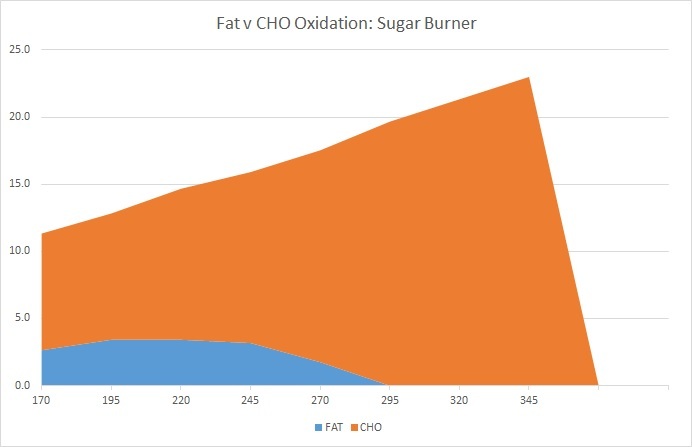 Due to the differences in the relative O2/CO2 demand of each substrate, an RQ of 0.7 denotes 100% fat burning, while an RQ of 1.0 denotes 100% carbohydrate burning. For easy analysis & assessment of how your fat burning stacks up, I've provided a spreadsheet below. You can plug your power, average kcal/min and RQ numbers from each stage into the cells on the sheet and it will calculate fat and carbohydrate burn in kcal/min & spit out a pretty orange and blue fat vs carbohydrate chart that you can compare against some typical athlete profiles further down the page. Here is a typical profile from the test data of an elite male Ironman athlete, you can see relatively high and broad fat oxidation (blue) even up to quite high power numbers, with max fat oxidation values of ~7kcal/min lasting all the way up to 295W! This is a very positive adaptation when it comes to metabolically limited endurance sports! You can even see a little bump in fat oxidation at race pace, indicative of the specific metabolic training that occurs at this point. However, in addition to quite impressive metabolic fitness, you’ll also note equally impressive levels of absolute energy output, i.e. 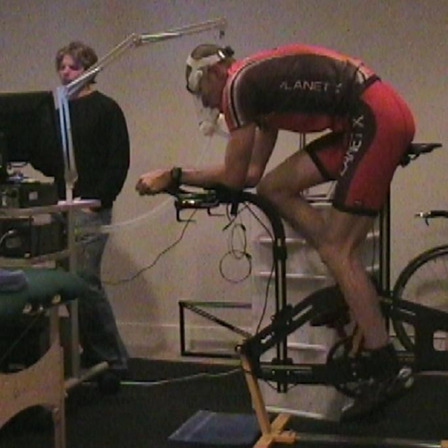 pure aerobic power – approaching 30kcal/min at the end of the test. Lots of blue (across the board) but also lots of orange! When it comes to the power levels that typify fast Ironman racing, metabolic efficiency is important but so is plain old ability to generate aerobic energy! Case 2: Professional ITU triathlete. I provided this example to put the metabolic specificity of the Ironman athlete into a little more context. You can see that the profiles are quite similar in a high level of pure energy generation (power) - the far orange bit of the curve. This athlete is 14kg lighter than the Ironman. So, in terms of maximal relative output, they're both impressive, with a slight edge in w/kg to the ITU guy. 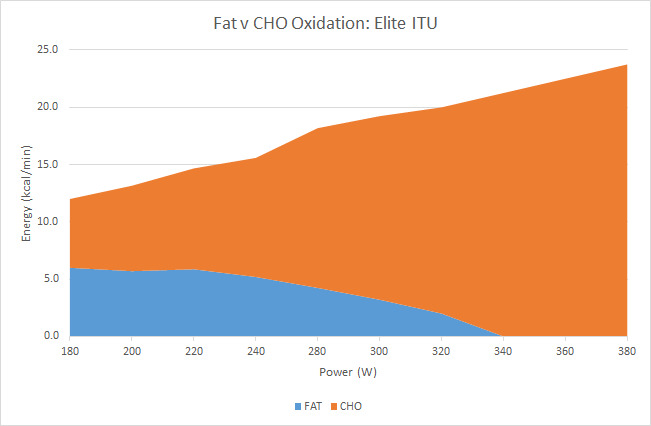 But there are some differences in the pattern of the blue fat oxidation, especially at higher power outputs. While both athletes have a strong metabolic 'base' at the shallow end of the curve, at 300W, the short course specialist was getting ~2kcal/min from fat oxidation, while the elite Ironman was getting ~6. Put another way, the ITU specialist was burning through ~17kcal of his carbohydrate stores per minute at this intensity, while the Ironman athlete is only using ~13. This makes a significant difference in each athlete’s time to fatigue at 300W & is indicative of the specific adaptations to that moderate power range that separates the 2 - a difference that often manifests in a difficulty in 'stepping up a distance' for very talented short course athletes. Case 3: Metabolically limited athlete. Case 3 is an example of your typical metabolically limited ‘sugar burner’ athlete. And, make no mistake about it, in the current H.I.T. (high intensity training), high stress, candy bar popping climate, they are ubiquitous! Of all the metabolic tests that I’ve done to date, more than 80% of them have had max fat burning rates under 4kcal/min! There's a lot less blue! If we come back to those elite long course power ranges, you can see that at 300W, this athlete’s fat burning has completely shut down and that 100% of his 20kcal/min energy requirement is coming from his limited glycogen stores. If we go back to our elite Ironman, this is almost twice the sugar demand at the same output! Meaning the fuel stores are going to run out in half the time! If your test looks like the above, it is almost certain that it is limiting you from the Ironman performance that your pure fitness would indicate is possible. If this is you, it is time for a radical shift in both your training content and your nutritional approach! 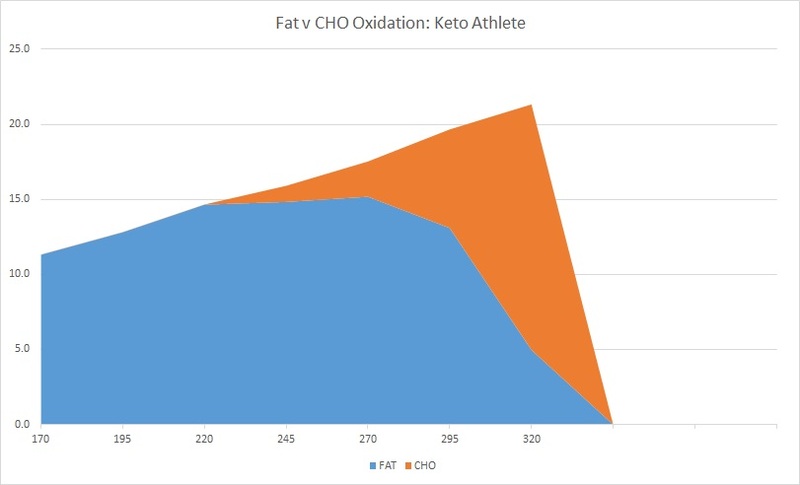 With the popularity of ketogenic diets for endurance athletes over recent years, I’ve had the chance to test a handful of high level age-groupers following a ketogenic (ultra low carb) approach. One (fairly typical) example of these tests is shown below. Typically these athletes show a whole lot of blue, i.e. very high levels of fat oxidation, better than most of the pro athletes that I’ve tested but their orange, i.e. ability to generate energy from glycolysis (sugar burning) is (unsurprisingly) curtailed. 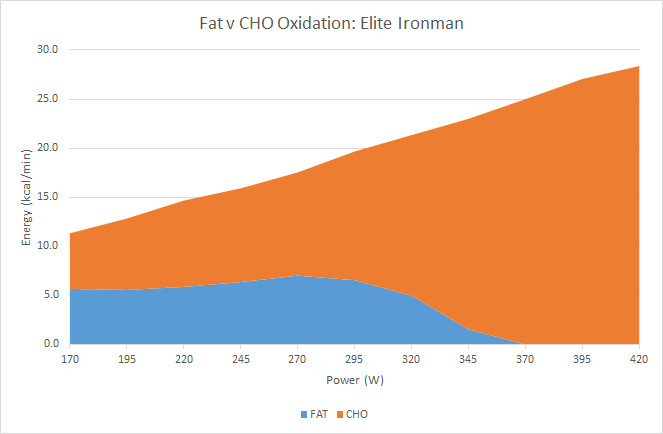 This particular example - the highest fat oxidation numbers that I've seen to date - was from a larger athlete (83kg). You can see he is very strong at good AG power outputs of ~3w/kg but there is little orange ‘room to grow’ to those larger power numbers that would be more representative of the elite race. Everything shut down completely at 4w/kg (a total energy output of ~20kcal/min - 10kcal/min shy of the 'big dogs'). If this is you, you may want to consider a progressive re-introduction of some CHO during certain phases of training, coupled with more of an emphasis on training in those areas of the curve that have been hard to reach. Based on what I’ve seen to this point, in my opinion, the ‘ideal’ curve that we want to see, especially for truly competitive Ironman athletes is more in line with the first example, i.e. an athlete who is metabolically balanced - very strong at generating energy from each of the aerobic energy systems – the blue lipolytic ‘fat burning’ power and the orange glycolytic ‘sugar burning’ power. The truly fast LC guys tend to be able to generate around 1/3 of their energy production from fat even at very high (race specific) outputs. Additionally, they have a reserve of pure aerobic power that makes these fat burning efforts submaximal and sustainable. For an athlete to be truly competitive in this day and age, we need every available energy system chipping in!